Instruction in language, diction, recitative, performance practice, score study, etc. The Studio Program is a personalized summer intensive designed to emphasize the study and application of vocal technique, overall musical development, and performance experience. Studio singers learn to apply the necessary skills of a successful career by study, observation, and real performance experience. Studio Artists are assigned roles to be performed in the Studio productions outlined above and/or a scenes program. Opera productions will be performed with orchestra, scenes programs are performed with piano. 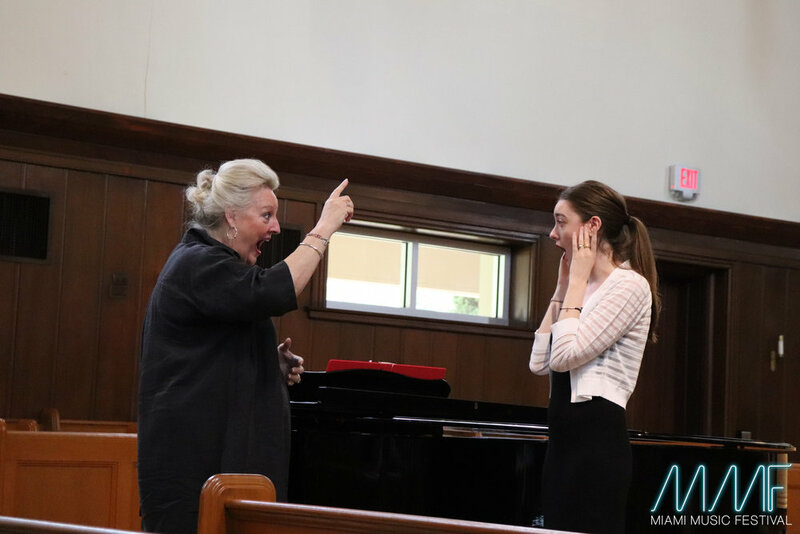 With initiatives to launch artists into the next level of personal development, Studio singers also follow a high-level curriculum of daily instruction in languages and diction, recitative, performance practice, score study, movement, daily small-size master classes with MMF faculty, and more. Studio participants may also perform in one or more mainstage productions in chorus or as covers; all participants are guaranteed at least one additional performance outside their assigned role, which may include local concerts of Opera Arias, Musical Theater and Zarzuela, and are guaranteed participation in at least two master classes, in addition to their daily studio class. Zarzuela Project – A select number of vocalists will be accepted by audition to the Miami Music Festival's Zarzuela Program. Singers receive individual coachings on the style of Zarzuela and have the opportunity to perform this repertoire in a special concert led by our Zarzuela Program Director, Roberto Berrocal. Meal plans and linen packages also available for purchase. Live audition: limited openings available in select audition locations. Please check our yaptracker application for availability. Video audition: MMF is still accepting video applications for the Apprentice and Studio Programs.